Nord Krauskopf's K&K Insurance team, including driver Bobby Isaac and Crew Chief Harry Hyde, proved to be a formidable combination on the NASCAR tracks. 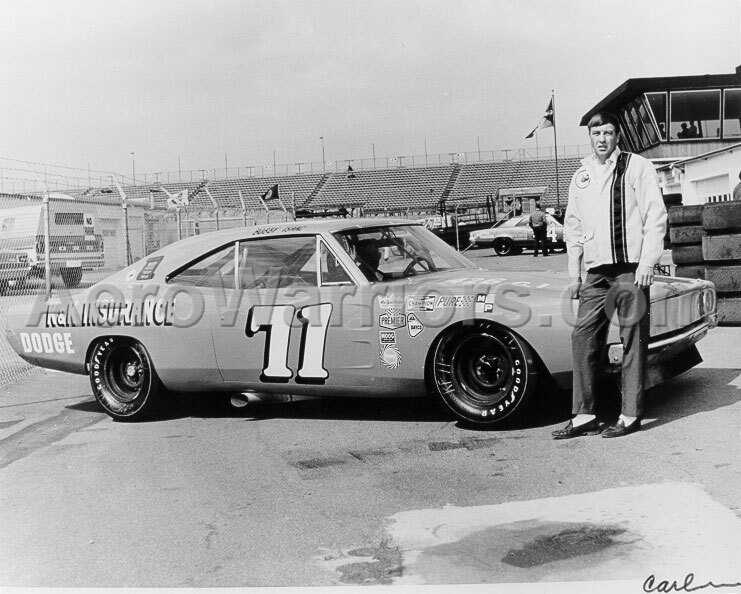 Over the 102 races held during the 1969 and 1970 NASCAR seasons, Isaac and the K&K team garnered an amazing 34 poles, 28 wins, 61 top five finishes and the 1970 Grand National Championship. 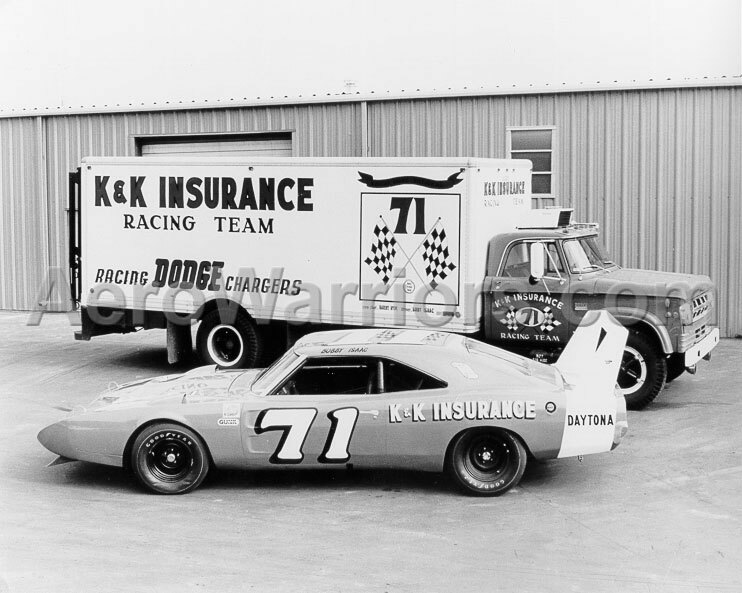 Although the K&K team's time on the NASCAR tracks has long since passed, race fans can still see the remaining #71 K&K Insurance Daytona, which is on display at the International Motorsports Hall of Fame and Museum. In recent years, the famed #71 Daytona has gotten back on track, driven now by Tim Wellborn. 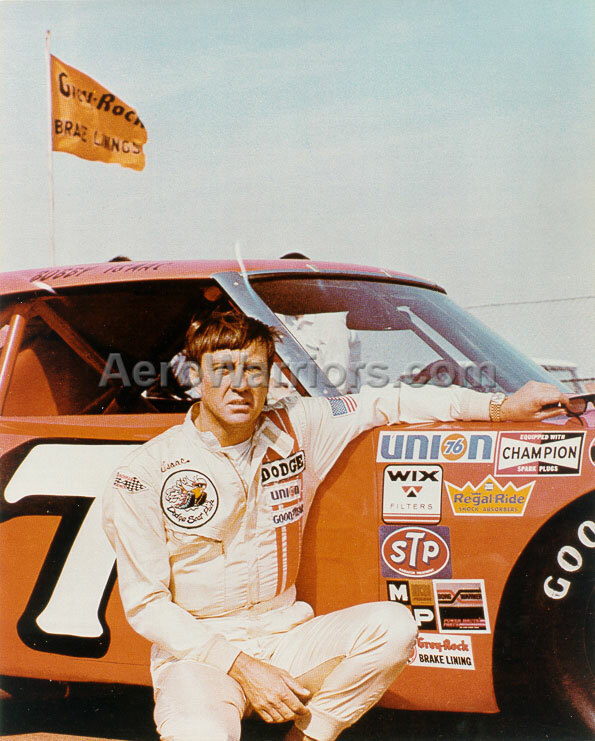 In addition to being the modern day pilot of the #71, Tim also maintains a sizable collection of various NASCAR memorabilia, including many K&K items. 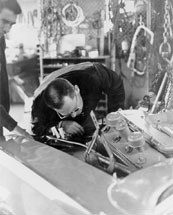 These are a few of the photos from his collection. Left: Bobby Isaac poses with the #71 Dodge Daytona. 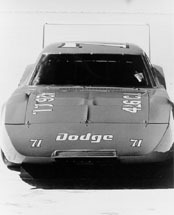 Isaac competed in 22 races in his winged Dodge, winning once and capturing six poles. 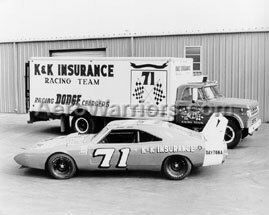 Right: The #71 and its hauler. 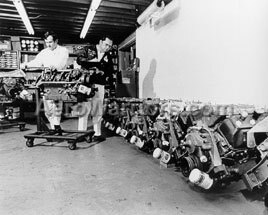 Quite a bit different from today's multi-million dollar, mini race shop/car transporter combos! 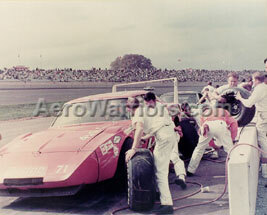 Left and Right: Isaac is in for a pit stop during events at Talladega. Left: Crew Chief Harry Hyde and another team member busy preparing superspeedway Hemi engines. Right: Squeezing a Hemi into a race car - never an easy task. 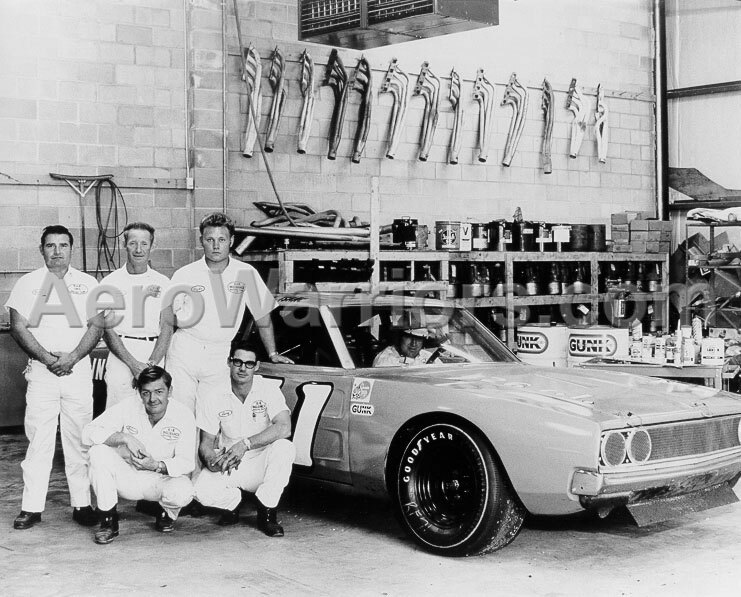 Left: Members of the K & K Insurance crew pose with a Charger 500. Right: Isaac with a Charger 500, probably at Daytona in 1969. 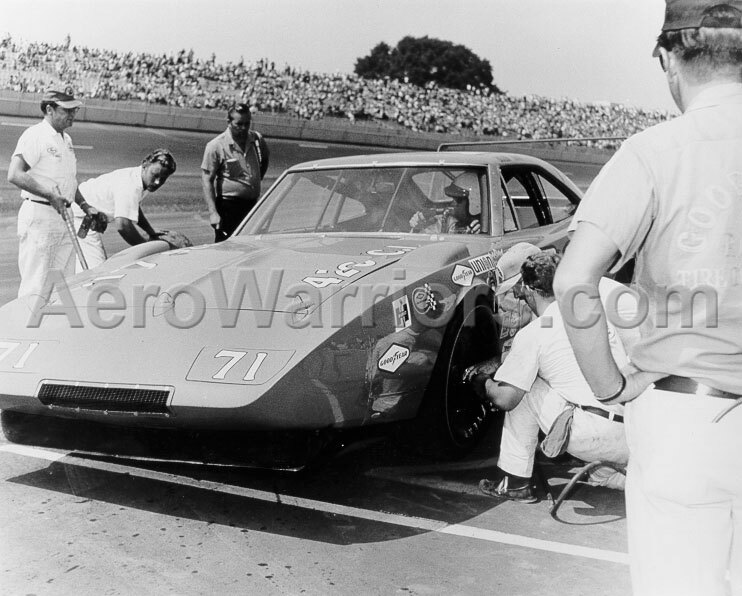 Once the winged Dodges debuted in September, 1969, Bobby's Charger 500s were relegated exclusively to short track duty. Left: Harry Hyde and the SK Tool girl sip champagne in the garage area, in what is likely a publicity shot for SK. 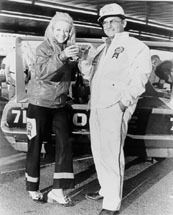 Right: This photo was taken at the Bonneville Salt Flats, during the K & K Insurance team's visit there in 1971.